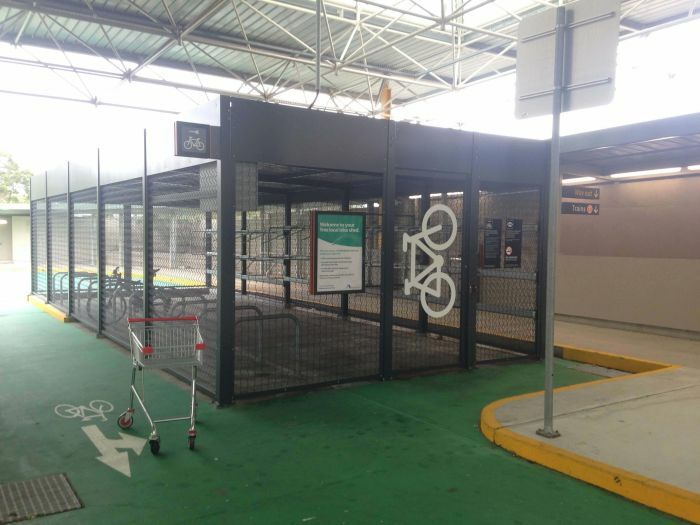 REDFERN: The only notification of impending changes to the eastern entrance to Redfern station has come via small signs attached to bike racks around the station and between bikes chained to the pedestrian barrier along Gibbons Street. The signs announcing “Removal of bike racks at Gibbons & Lawson Street corner – a new bike storage facility at Redfern station coming in 2018” warn cyclists that from March 2 the racks will be removed along with any remaining bikes. Incidentally, the signs also mention “A new station entrance at the corner of Gibbons & Lawson streets to replace existing Gibbons Street entrance”. In addition to other well documented safety concerns within the station, the narrow footpath on Gibbons Street near the station entrance allows little room for pedestrians leaving the station to safely wait before crossing at the traffic lights. Representatives from Sydney Trains and Transport for NSW attended a REDWatch meeting on March 1. Images were shown of the new entrance to be completed by the end of 2018, which will be the next stopgap measure to patch up Redfern station. About 10 gates will replace the Gibbons Street entrance which will be closed off completely. The new entrance will feature a perforated metal and glass wall with murals designed by Aboriginal artist James P. Simon. 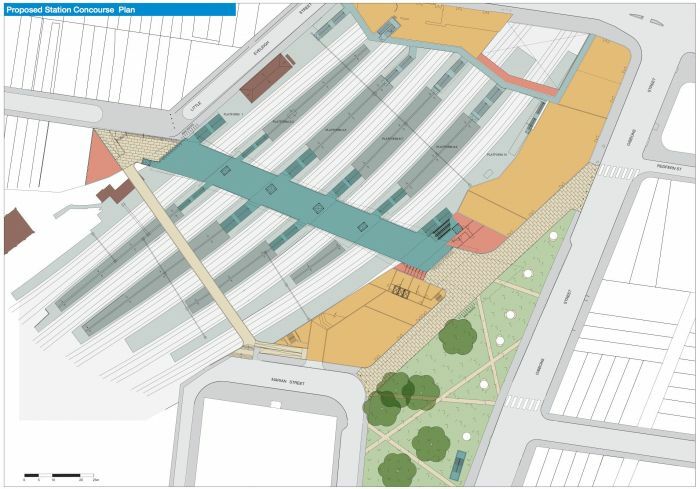 Passengers will leave the station onto a larger holding area on the corner of Lawson and Gibbons Streets, but this will not resolve issues for people with mobility difficulties who will have to walk further to negotiate journeys to the east or south of the station. REDWatch was informed by Jenny Leong that her office has lodged a GIPA [Government Information (Public Access) Act] request about the upgrade of Redfern station to find out “how far advanced the government plans are; how the project will be funded; and if there have been any talks with private developers”. Since 2009 the number of people going through the gates at Redfern station has increased 67 per cent to 64,000 each working day. This does not include the additional 20,000 who already change between lines at Redfern. The ATP (Australian Technology Park) will be the destination for many new passengers with 10,500 finance workers who will be commuting to the soon-to-be completed Mirvac development for the Commonwealth Bank. A report in The Australian (March 1) refers to a merger that will see media workers relocated from Pyrmont to Channel 7’s ATP Media City in numbers not previously included in projections. Also not included are workers at future developments in North Eveleigh as reported in the Sydney Morning Herald (March 3) where Mirvac is pitching a technology hub with Google’s Australian headquarters as the anchor tenant. The seven cranes on the skyline south of the train lines bear witness to the extent of developments with Mirvac’s first building “topping out” ceremony in the last week of February. With the development of the Metro line, which will see trains from the Bankstown line go via the new station in Waterloo, from 2024 two lines at Redfern station (Platforms 8 and 9) will become redundant. Despite assurances that the need for a full upgrade for the station is well recognised by Transport for NSW, the well-worn excuses were again cited. Difficulties that the site presents, being in a cutting with no firm anchor points; the problems of development on a station with so many tracks passing through it, with narrow, curved platform lines. The only indication of a way forward given to the REDWatch meeting was an image from the past – a 2010 plan for lifts from existing platforms to a bridge between Little Eveleigh Street and Marian Street. Now that the Opal card system is fully operational, they could re-open the gate at the corner of Wilson and Little Eveleigh Sts. This would have two benefits at least. There would be less foot traffic up Lawson St from Sydney Uni, and lifts could be installed at that end of the platforms. This would not be a total fix, but a lot of problems could be ameliorated if this was done.I have suggested this to Andrew Constance’s office. All I got was an acknowledgement that my email was received. This has got to be one of the biggest “easy wins” for Redfern and transport that’s that’s simply being ignored. Selling the technology Park netted $260 million, i can’t believe it’s not a prerequisite of the Com Bank build that Mirvac support the station upgrade. Or Mirvac have not asked it of the government. The big loosers are the people of Redfern, Waterloo and darlington. The bridge could also be further south on the platforms connecting beside the heritage rail building at the end of Wilson St and the technology Park northern tip. In the summer of 1978-79 movies were worked on, in Australia, for big names, Speilberg, Lucas, Penny Marshal were the start – we’ve done over 100, and written music for 70 plus bands and artists, the Wran and Joh corruption boys and girls always were international, it just went bigger, and the railway yards at Everleigh were promised as future studios, with the Flour Mill site at Lewisham, and modular studios in old telephone exchanges all over in the inner South West, Granville, a notable. – corruption keepers of NSW and Qld, ran it as a take, and top and tailed the write as if we the artists were human beans. They raised their kids to carry and carry on with guns, and Australian International trade in art disappeared up its arse with sycophantic posturings and propped up princesses still suspiciously living long and fruitful lives. Our group had so-called handlers that included Ann Day, David Stevens…and David Wood ( the cousin of George Pell ) Stevens was NSA, a mate of Dads, my father while his brother was a test pilot on F1-11’s. When Guns make artists they don’t pay them, and that has to stop.